شروع بازی های نا معمول را شرح می دهد ریچارد پالیسر با توضیح دادن طرح ها نقاط ضعف و قوت امکانات تاکتیکی و ........ را با سفید و سیاه توضیح می دهد تا خواننده با اعتماد به نفس کافی و با دانش به آنها پاسخ دهد. You may be happy with your main openings – sorted with the Sicilian and content with the King's Indian – but are you afraid of the unknown? Do you fall to pieces if your opponent plays something strange in the opening? Here's some good news... Beating Unusual Chess Openings is a godsend to those chess players fed up with struggling against all opening moves other than White's main two: 1 e4 and 1 d4. 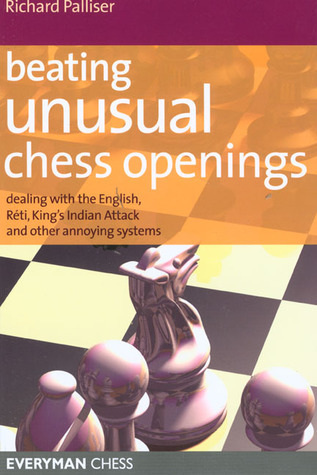 From the respectable (English Opening, Réti and King's Indian Attack) through to the offbeat (Nimzo-Larsen Attack, Bird's Opening) and the totally bizarre (Orang-utan, Grob); everything Black needs to know about facing unusual openings is covered within these pages. Richard Palliser gets to grips with all of White's possibilities, examining their strengths and weaknesses and in turn organizing a reliable and practical repertoire for Black. He discusses the key strategies, tactics and move-order tricks for both sides, arming the reader with enough know-how to face this assortment of chess openings with renewed confidence.